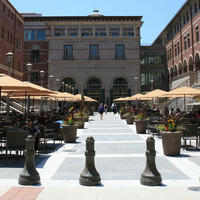 The Ronald Tutor Campus Center is a gathering place, built around International Plaza at the heart of the University Park campus. It houses the Admission Center and the Epstein Family Alumni Center, along with student offices and boardrooms, study lounges, multipurpose event spaces, technology resources, game and entertainment areas, and a variety of dining options. It was wonderful being in the presence of, and hearing the experiences of, these living legends. How do we submit follow up questions? This event was everything! It was all I could talk about since December and it did not disappoint! The most amazing and inspiring speakers. This day and event is exactly the kind of experience I chose to come to USC for, highlight of my Spring semester! The Own It team did the most wonderful job with this event and I can't wait to see what next year brings us! the line is sooooooo long and I just gave up lining there for certain hours so I have not enjoyed the food or the event. There were long queues and half of the lines were closed at 12pm when the event was scheduled to end at 1:30pm. It was great, very helpful. However, I wish there would have been more employers so that students didn't have to wait in line for so long and get to get our resumes reviewed by more people. Meet with new friends, nice!